HONDA BRV PROBLEM – OWNER REPORT – HONDA MALAYSIA AFTER SALES SERVICE GOING BAD? This is a list of complaint from Honda BR-V Owner written on Honda Malaysia FB. According to the BRV owner, a lot of new 2017 Honda BRV suv 7 seater in Malaysia are having a lot of quality issues such as dust in cabin, rattling sound and some of other owners reported a bad component fitment from the assembly line. The worst is, Honda Malaysia now reported to have a bad after sales and customer care in Malaysia maybe due to too many Honda cars sold nowadays in Malaysia and they cant cope with the after sales. ” Dear Mr Katsuto Hayashi, Mr Suren & Management Team of Honda Malaysia. 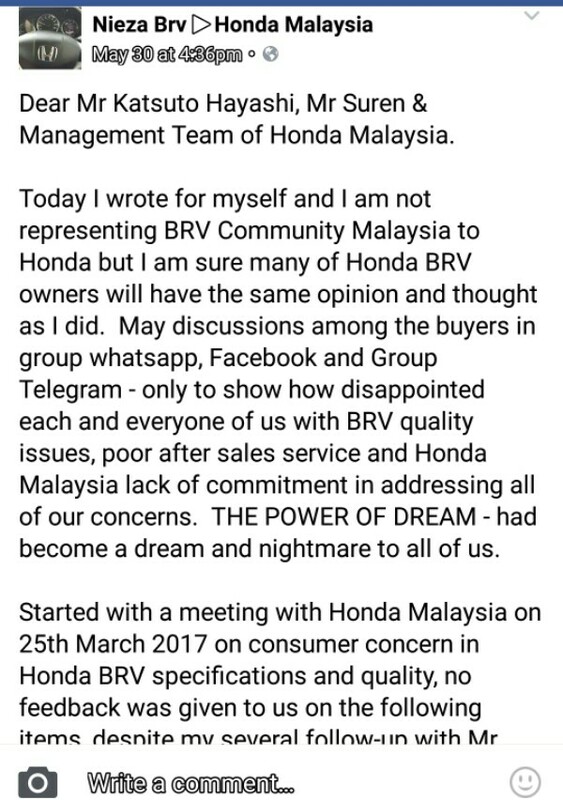 Today I wrote for myself and I am not representing BRV Community Malaysia to Honda but I am sure many of Honda BRV owners will have the same opinion and thought as I did. May discussions among the buyers in group whatsapp, Facebook and Group Telegram – only to show how disappointed each and everyone of us with BRV quality issues, poor after sales service and Honda Malaysia lack of commitment in addressing all of our concerns. THE POWER OF DREAM – had become a dream and nightmare to all of us. Started with a meeting with Honda Malaysia on 25th March 2017 on consumer concern in Honda BRV specifications and quality, no feedback was given to us on the following items, despite my several follow-up with Mr Suren, Honda Malaysia customer service representative. 1. Rattling sound at the dashboard while driving – please advise the next actions to be taken after Honda had finished with the investigation. Many of BRV owners are facing this problem and waiting for Honda directions. – No feedback from HM till todate. My car still having this problem, seems like I am driving a lorry rather than a Honda car. Worse, went to SC couple of times – they requested to leave the car for one week and not able to guarantee it can be solved as they are not sure what is the real problem and even pointing back at manufacturing plant. I experienced this with SC in Bandar Bukit Raja and Setia Alam, Selangor. 2. Dust from external into the cabin – this was not addressed in Honda replied letter to us – The pre-claimed statement from Honda Malaysia representative during the meeting that BRV was equipped with 7 years technology ahead and it does not requires a cabin filter to trap all the dust from outside is just nonsense. Many of us experienced dust came into the car and we can see on the dashboard and radio panel. While Honda claim it is the state of art technology, to us it is a technology failure. Now, we have to purchase cabin filter from SC on our own as around RM200. Many of us has fixed it as we could not bear with the dust anymore. I have many photos from BRV owners and would be glad to share it with Honda Malaysia, provided Honda is really serious in listening to us. If not, I am not wasting my time with Honda anymore. 3. Cabin Filter – will arrive by end April. Awaiting for Honda advise when the stock arrive and the price. – No information was given to us by Honda Malaysia and we have to keep on asking from SC. Now, we get to know most of us went to SC to fix it. Frankly, I don’t see Honda Malaysia seriousness in handling our complaints/feedback. There was not response from Honda Malaysia on the 3 above issues and my numerous follow up with Mr Suren went into dead end. I am very disappointed with Honda Malaysia customer service and please don’t bother to get Suren or Livinder to call me to explain on this. I think I had enough with all this fairy tales and empty promises. These guys are not proactive and it is a shameful to Honda to have customer service department that is slacking in attending to customers especially when the initial step has been established. We are still struggling with SC relunctancy in handling our cars issues. We are still struggling in getting appointments to fix our car during weekends. We also struggle to get our car fix but instead we were asked to come again and again for separate complaints. We end up buying cabin filter separately and Honda charge us expensive for this, and fixing outside we will face void warranty. The dashboard sound, the dust, cabin filter are those common issues in BRV. Seems like it is OKAY for Honda Malaysia to let its customers struggle with all the quality issues and SC is just taking very lightly. Maybe one voice is too small for Honda Malaysia to pay attention too. Maybe a group of BRV owners carries no impact to Honda sales volume and the company profit margin. We have seen many no one companies in the world collapse including banks, I am not surprise if one day Honda will succumbed into this situation and many will agree with me that Honda deserves this. Poor quality of Honda BRV, bad sound proofing, dust into the cabin, Cabin filter to purchase on our own, Rattling sound at dashboard and with no feedback/response from Honda Malaysia after the complaints – only shows how bad is the after sales service of Honda Malaysia. I will seek for other alternative methods in getting my car fix and for my voice being heard – that is for sure. Kepada Honda Malaysia. Saya nak buat aduan dan luahan rasa tidak puas hati dengan kereta Honda brv yang saya beli belum lagi setahun sudah macam2 masalah yang telah saya hadapi.1st sekali bau dari luar masok ke dalam.Masa tu kereta baru 4 hari keluar dari kedai kereta Honda.saya buat aduan belum masa 1st service.Selepas masalah bau masuk saya menghadapi masalah aircond dekat hadapan.Aircond tidak sejuk.Bunyi angin kuat dari aircond hadapan.saya buat 2 kali aircond hadapan tu baru guna 4 bulan.Selepas aircond hadapan saya mengalami masalah aircond di belakang.aircond tidak sejuk.bunyi angin kuat keluar dr aircond yapi tidak sejuk.problem AC menurut service centre Honda.saya kena bayar rm175 utk 1st complaint aircond belakang.Pihak service centre kata dah ok boleh collect kereta.Tetapi masa saya ambil dan check aircond belakang masih jugak tidak sejuk.TAPI saya DAH BAYAR RM175.Masalah masih sama.saya buat aduan lagi untuk yang ke 5 kali untik masalah yang sama.Ok pihak service centre kata ada spart part dlm aircond yang melibatkan AC rosak kena tukar tapi stock tidak ada kena tunggu order.berapa lama dah saya kena sewa kereta lain untuk pergi kerja.ok ada berita baik sparepart dah sampai.ok mereka buatlah apa yang patut..ok semalam service centre call suruh collect kereta sebab kereta sudah ok.But saya cakap make sure betol2 bagus.jgn nanti saya pegi collect tapi masih juga problem.berapa sudah masa saya ulang alik nak pergi collect tapi kereta masih problem.Rupa2 nya masih ada problem tidak sejuk.Yabg saya tidak boleh terima sebab dari service centre kata Honda Brv aircond belakang memang tidak sejok.kalau bergerak baru sejok.Hello saya bukan bodoh punya orang ok.suka hati cakap yang semua BRV aircond tidak sejuk..saya tidak dapat terima alasan yang tidak munasabah.ok bila saya buat perbandingan kereta saya dengan kereta brv yang service centre punya memang ada beza.kereta saya tidak sejuk dan kereta service centre sejuk.jadi apa tindakan pihak Honda terhadap masalah kereta Honda BRV saya.Sila beri kerjasama secepat mungkin. cabin filter nak cari di mana ye? Kerusi tengah yg Blh alih berbunyi semaa kereta dipandu. Teruk lagi bunyi apabila kereta naik Turun jalan yg berlekak lekuk. Tk pyh anta di honda dh kak…buang masa buang duit buat tk elok2 duit ambik tpi buat kerja mcm haprak! Nama je HONDA….bukan honda Hargphuiii! !